Normal posting will resume shortly! Cleaning the Eye: Still Lives everywhere! This is a blog post from my friend Beatriz. I love her attitude to squeezing inspiration out of everything she sees. https://pomegranatestudio.co.uk//wp-content/uploads/2017/08/Pomegranate-logo.png 0 0 Ann Rippin https://pomegranatestudio.co.uk//wp-content/uploads/2017/08/Pomegranate-logo.png Ann Rippin2014-01-28 10:33:382014-01-28 10:33:38Cleaning the Eye: Still Lives everywhere! Last night I gave my talk on Laura Ashley to the Broughton Gifford Quilters in Wiltshire. We drove down endless dark country lanes, watching out for headless riders and the like, but the venue turned out to be behind a great pub called The Fox, which did the best fish and chips we’ve had for some time. I was glad the Medieval Historian agreed to come with me because even with satnav I think I would have lost my nerve going home when the fog had become really dense. Terrible photo, but it shows the little flower print. The heraldic print the front is one of my favourites and the Indian woodblock print design at the top right is a very early print. These are real vintage fabrics. I also gathered more wonderful stories and one woman had even written hers down for me. I was stunned by this amount of generosity, but also by the delight that this work seems to bring to people. It is a kind of memory work, very much based on a material stimulus, and also associated directly with a brand, which I think makes it unusual in academic work on memory and life writing. It is also a form of oral social history, which would be worth exploring, as again, it concerns a brand. I will have to consult the Medieval Historian about this. So, it is an interesting methodological project, but I am also delighted that the people who tell me there stories or show me their treasures get to enjoy being involved with the work. This really does feel like work for and with and not on people. Roll on the next talk! I don’t normally reblog, but this is worth seeing, and despite everything, the photography is excllent. On Thursday night I went to the Emerson Green Quilters in Bristol to give a talk on my Laura Ashley project. It was a really good evening. I was delighted to see how much they loved the things that I had taken with me, and how much they loved handling the stuff and reminiscing about the brand. They gave me a set of great stories to add to my bank of narratives, and an old friend gave me a pile of pre-cut squares in a design that I don’t have. I love this particular group and always say yes to an invitation to go and talk to them. They really seem to go for a great night out and don’t give off even a whiff of ‘come on, then, impress us’, which I have encountered elsewhere in the past. I was a bit surprised when one of them came up to me and said she was disappointed that I hadn’t talked more about my academic work in social sciences. That’s something I’ve never heard, and never expected to hear. So I gave her a quick run through the theoretical background which seemed to be enough. It did make me think about developing a talk on the sociology of cloth, which is a subsidiary interest of mine. This all came after a day discussing sustainability and enterprise in the curriculum. The last speaker of the day harangued us yet again about how deficient our teaching methods were and how effective his were, based on psychology and design theory. No matter how valid these ideas always are, I get very fed up with it, and the constant droning on about how ineffective lectures are. ‘When did you last have a great idea or feel inspired? I’ll bet it wasn’t in a lecture.’ And so on. I’m not sure about this. I have always found Mark Steele’s comedy lectures engaging and thought provoking, and I am pretty sure that the women who turned up to hear me last night were creatively engaged in thinking about their relationship to the brand. The Medieval Historian, who had accompanied me, said that they were all talking about Laura Ashley and what they felt about it as I passed round my examples and samples. I concede that we should think about how we lecture and what we do to students that makes them potentially so passive by the end of the first term, but to dismiss lectures in general always strikes me as rather shallow. The Medieval Historian was there, by the way, because I had tripped over the mat and bashed my temple and was in a bit of shock as I was loading the car. I am not seeking sympathy here, but rather wanted to make a point that I have noticed throughout my career: adrenaline is a wonderful thing. It will get you through any performance of any kind. So you hear people say that they have terrible colds and their voice might give out, but it never does, because of adrenaline. I didn’t fancy driving in the dark and rain, but I knew I could do my performance and that the minute I stopped I would be exhausted. And I was right. But it was worth it for a lovely night at Emerson’s Green. I hope they invite me back soon. 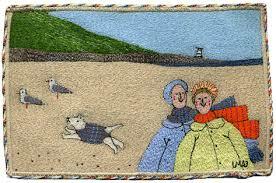 At Bristol Quilters last night we had a really great talk by Linda Miller who is a professional embroiderer. It was particularly interesting because she talked as much about her business as about her embroidery. I loved her dogs in coats which featured in several pieces, but I was also interested in listening to her talking about pricing her work, working with card companies and galleries, getting commissions, bearing to part with work, having to sell to people you don’t like because you have to pay the mortgage and so on. She talked about getting support and working in a collective with other artists, and setting up a studio. Her work is charming – which is an overused word, but I think it fits, in the sense that her personal vision is enchanting and draws you into her world. I liked her unusual braided edging and the fact that she doesn’t straighten the work but allows it to distort following the tension in the stitching. Plus I thought she was absolutely right when she said that you have to give up any idea of control over your work and that you have to let it be what it wants to be. I would recommend her to any stitching group. I really just make the dolls for fun and a sense of achievement to see in the New Year, but this one did seem to herald a year which was to have some very glamorous moments. This year’s is very different. She is very folky, and if anything she is about craft and going back to basics. She is a bit of a cheat because I didn’t make her on New Year’s Day, mainly because I spent quite a bit of it on the M42 and M5 in driving rain hoping it didn’t all end here as I overtook lorries in a cloud of spray. So maybe this doll is about survival. She is made entirely of scraps, samples and leftovers. The fabric is all from a big bag of tiny furnishing fabric samples that my mother and I sat and sorted on New Year’s Eve. We pulled off the sticky labels which identified the fabrics on the back. My mother remarked that it was just like piece work which is what a lot of women did when I was growing up to make money to support their families. They mainly worked in the Nottingham lace trade, and did things like separating strips of lace with a hot wire mounted on a box to make edging lace from a large machine-made piece. There has been an awful lot written about exploitation and piece work and home work and women working for pennies, but that afternoon, and granted it was only one out of a lifetime and not something I had to look forward to all day every day, was really nice as we talked as we worked. I don’t want to sentimentalise all this, but I can see that working with your family at home rather than in a factory with a foreman might be a preferable way to earn a living. I am really looking forward to using it, although a bit sad because it will be the last. I like it because it has such wonderful subtle random colour, is really strong and soft and glides through fabric. I wastefully use it on construction rather than just embroidery, as a real luxury. And the bit of silk among the cotton. The final two pictures were taken with a very cheap clip on macro lens that I bought for my phone camera. I like to use the phone camera for the blog because the pictures load so much more quickly, but the phone takes ropey close-ups. These are a bit better. I still can’t find my fancy camera which I bought expressly to take close-ups, so this is a compromise. With luck the photography on this blog will improve next year. Finally, and this might say something about what next year will bring, I prefer the back of the doll to the front. I like the simple stitches. Typical. Why did the author knit the chicken? This is probably the first time in about ten years that I haven’t taught my creativity module at the University. Apart from missing working with some lovely people, I haven’t minded not teaching it a bit. It always sounds like an interesting thing to teach but actually it is quite dull. Experts tend to write very boring things about a seemingly fascinating area, or they write the same old stuff over and over again. If you are interested in Creativity Techniques, which is a sub-genre of the whole thing, I still think that Roger von Oech’s work is the best. If you are interested in what the creative state is like then you could do worse that read a bit of Happiness by Csikszentmihalyi, or see a bit of him here. For a telling it how it is about creativity I would recommend Dangerous Ideas by Alf Rehn, which is a really good read apart from anything else. That would be my ideal creativity course really. I mention all this because I was interested to find myself spending quite a bit of time over the New Year holiday making the chicken you see in the picture. I bought the knit a chicken kit at the Knitting and Stitching Show at Alexandra Palace this year. I have no idea why I bought it. It was the first thing I bought. I just saw it on a stall out of the corner of my eye and I knew that I really wanted to knit it. I ended up having a conversation about the kit with Stewart Hillard from The Great British Sewing Bee on BBC 2. I knew I knew him from somewhere, but couldn’t place him until I saw the Christmas Special. He was really delightful. We talked about how sometimes you just have to make something and you really don’t know why. And this is what I was thinking about with this chicken. I really don’t need a knitted chicken, but this one spoke to me. She had to come home with me. And I really enjoyed knitting her. I loved the quality of the chunky Icelandic wool knitted up in moss stitch, and the shaping of the beak and the comb. I loved having the skill to do that, and acquiring a new skill making the icord for the legs and toes. So, in Csikszentmihalyi’s terms I was in a flow state because I was practising skills and learning new ones. It was a difficult task but not one so difficult that I became anxious or self-conscious. I experienced that feeling of flow, when everything seems to go well. And this is important to me. I am interested in creativity and making, not the mental gymnastics of innovation or problem solving. I love to create with my hands for its own sake for the sheer joy of making. There are lots of other reasons to make: to show our love for others with baby quilts, or wedding quilts, or socks, or to impress others, or to make money, or to save money, but for me, making for the joy of making, and then wondering what I am gong to do with the end result – in this case a slightly wonky stuffed hen – later. There is a theory that we are genetically selected for our ability to make with our hands – so the very earliest of our ancestors would have had the greatest chance of passing on their DNA if they were skilled crafts people who could make things. I wonder though, if those very early makers might not have got all the girls (or boys) because they exuded a certain delight at being in the world, which is very attractive, which comes from making craft items with the hands. I have no idea what I am going to do with my chicken now she is complete, but she is an interesting talisman of creativity and one which I will keep near me in the coming year. https://pomegranatestudio.co.uk//wp-content/uploads/2017/08/Pomegranate-logo.png 0 0 Ann Rippin https://pomegranatestudio.co.uk//wp-content/uploads/2017/08/Pomegranate-logo.png Ann Rippin2014-01-02 15:16:262014-01-02 15:16:26Why did the author knit the chicken?